Forbes Magazine was one of many publications over the weekend to share the story (here, also the source of the image below) of multiple sightings of a rare fish in Japan. As the article states, “the giant oarfish, a deep-water creature living at depths (of) 3,300 feet, is the longest bony fish in the world…. It's presumed to be responsible for some sea serpent sightings by European sailors.” The National Geographic says they can grow to 56 feet (17 meters) in length and can weigh up to 600 pounds (270 kilograms). A fascinating video of the rarely-seen fish is here. 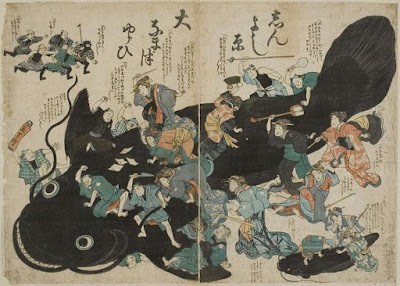 An old saying has it that the fish comes to the beach as an omen of a big earthquake. Kiyoshi Wadatsumi, a specialist in ecological seismology and director of the nonprofit organization e-PISCO that studies signs of earthquakes, said, “Deep-sea fish living near the sea bottom are more sensitive to the movements of active faults than those near the surface of the sea.” But he said the deep-sea fish found in nets or on beaches did not seem to be directly connected with earthquakes. I wrote a piece earlier (here) about the predictive nature of folklore and how those that went before us have tried to help warn us of potential danger. It’s easy to dismiss these tales as the simplistic ways our predecessors have tried to explain the natural world around them. And I’m not suggesting the downright panic the oarfish sightings have generated in some is justified. But, as I pointed out in the earlier piece, it’s worth letting even something as odd as a strange fish appearing in a fisherman’s net be the impetus to encourage better planning and preparation for a disaster we know is inevitable in the region at some point in the future. Much of the material I’ve included on this page deals with the “what’s” and “how’s” of hazard mitigation. It seems I’ve often ignored the “why’s,” assuming they were obvious. Our Board of Regents policy requires each campus to prepare and regularly update a facilities master plan (FMP). During the last few FMP cycles, the Board has recommended institutions address within their plans two critical issues: (1) environmental sustainability; and (2) community/stakeholder participation in the process. All FMP’s now incorporate these elements. All institutions signed the (former) President’s Climate Commitment and are pursuing goals related to climate (e.g., carbon) mitigation and sustainability. Most institutions are also addressing adaptation and resiliency, along with their mitigation efforts. We continue to stress the importance of adaptation and the fact that much of what is done for the sake of mitigating climate change will improve resilience as well. The State has also enhanced its focus on adaptation, and we’re working to comply with policies like those associated with Maryland’s Coast Smart legislation. A decade or so ago, our Board also asked every institution to complete an emergency preparedness plan. Again, this was completed quickly and effectively, and all institutions now have robust emergency preparedness and continuous operations programs in place. On the continuum of efforts that help inform our facilities master plans, the “missing link,” if you will, is Hazard Mitigation planning, intended to prevent or reduce the impact from a wide range of climatic, geologic or man-made disasters/events. As you know, these would include campus policies (or guidelines) for land use, building placement, construction standards, barriers and drainage, communications systems, etc. So far, only two institutions have completed a formal Hazard Mitigation Plan. 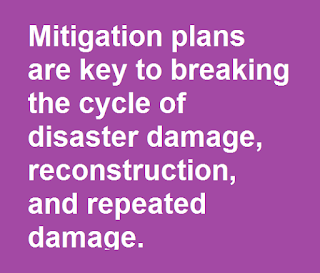 Given the current interest at the Board level with risk assessment and mitigation, I’d like to encourage all institutions to complete a hazard mitigation exercise; with the goal of ensuring that the next round of facilities master plans, as well as the resulting capital program, are informed by, and integrated with, detailed hazard data and mitigation policies. 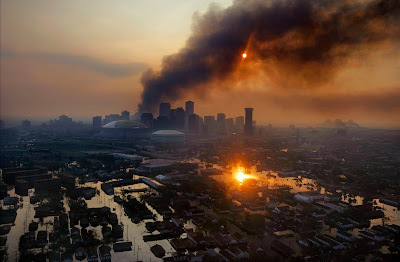 Natural and man-made disasters represent a wide array of threats to the instructional, research, and public service missions of higher education institutions... Disaster-related losses in the United States continue to rise. At all levels, organizations and governments are adjusting their behavior and policies to reflect the importance of reducing damage caused by extreme events. Hazard mitigation is accepted as good practice and many government jurisdictions now require it. Higher education institutions have an interest on many levels to become more disaster-resistant. 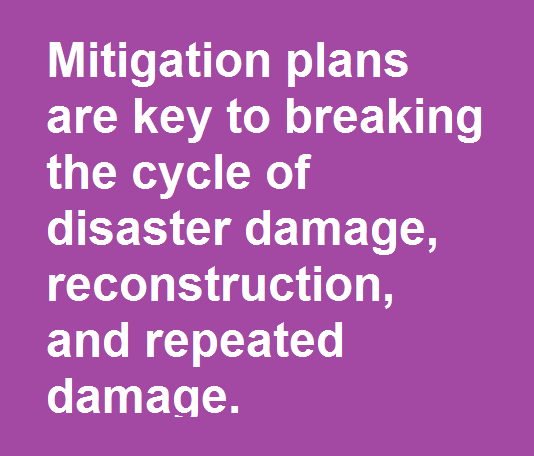 Higher education institutions are engaged in and skilled at planning exercises for a wide range of issues; consequently, the addition or improvement of campus-based hazard mitigation planning will yield substantial benefits. Moreover, steps taken to become more disaster-resistant can complement the long-term sustainability of the campus and improve the overall quality of life. · Communicate priorities to potential sources of funding. From a truly pragmatic perspective, having a FEMA-approved hazard mitigation plan is a prerequisite for receiving certain types of non-emergency disaster assistance, including funding for mitigation projects. That alone would be reason enough. 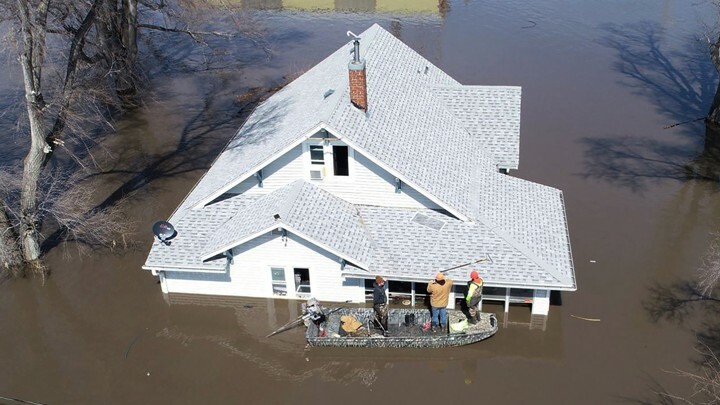 But in the end, the ultimate “why” behind hazard mitigation is that it guides and “enables action to reduce loss of life and property.” If we have to accept disasters as inevitable, we should never accept their impacts in the same way. We can and should do all possible to lessen their impact and protect the lives and physical assets with which we've been entrusted. The following graph appeared in my Facebook feed recently. On the surface, it's good news. 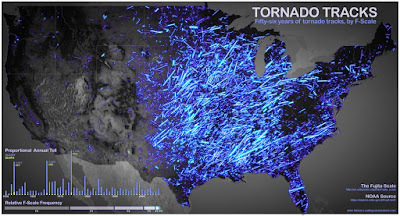 Whether a trend or simply an anomalous "blip" over a much longer term, recent years have seen less violent tornadoes. Last year (2018) there were none. Tell that to all those that lost houses or loved ones in tornadoes last year. A Fujita rating less than 4 or 5 doesn't necessarily make a tornado less deadly. While the poster didn't expound on what he saw, others (online) have immediately jumped on these data as a debunking of sorts to climate change. Ironically, the truth is that the number of tornadoes--like so many other climatic events--is increasing. Add this to the seemingly endless list of other disasters that grows every year, and it puts the "severe tornado" graph in perspective. One downward trend is worth mentioning. 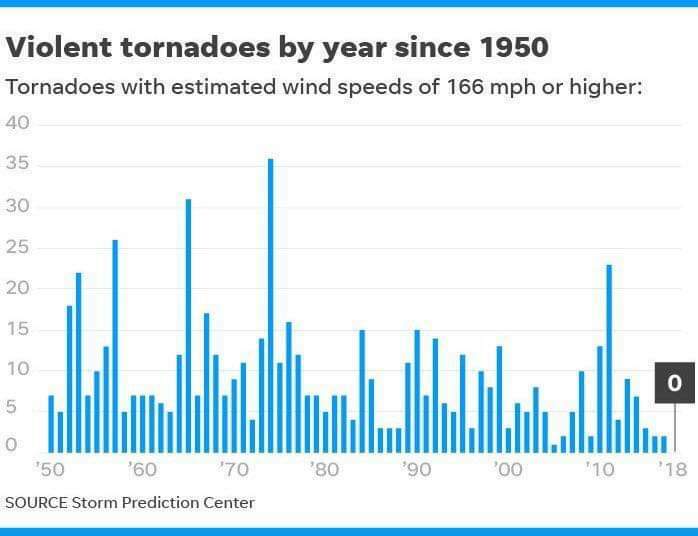 The number of tornado deaths in the US has been (fairly) steadily decreasing thanks to better warning systems and mitigation measures. Whenever I see an article posted about a recent event that suggests it will share "lessons learned" from the event, I'm immediately interested in sharing those lessons here. The recent volcanic eruption of Anak Krakatau in Indonesia that caused a landslide into the ocean, resulting in a tsunami that killed hundreds of people, was tragic and somewhat surprising. 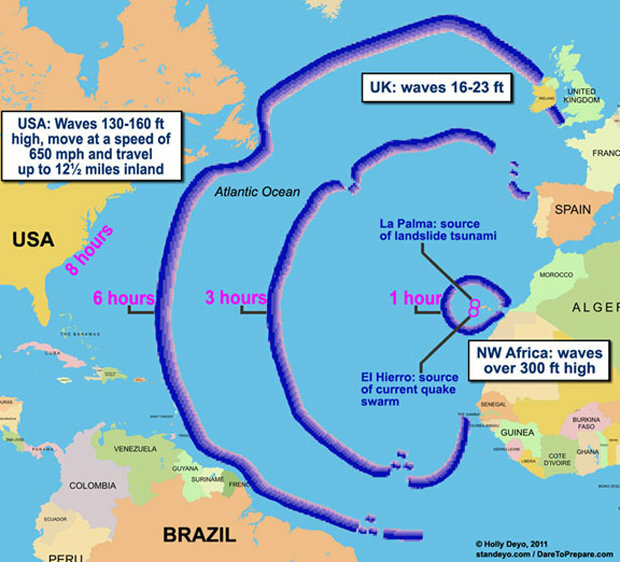 I've read about landslide tsunamis, including the devastating wall of water that a major landslide in the Canary Islands would supposedly fly across the Atlantic and inundate most of the eastern US coast, as far west as Richmond, VA. (See image above.) 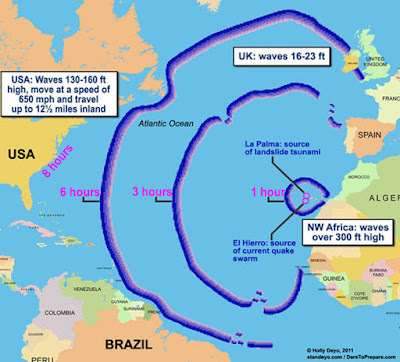 That said, such events are rare and even this "End of Days" event on the east coast has been debunked--sort of. Even so, I wondered what lessons could be learned. So I read the article (here). Two news pieces that hit my Twitter feed on the same day share overlapping themes related to the inherent risks faced by the world’s large urban areas and the most effective ways to reduce those risks. 1. An "ability to anticipate, reduce, mitigate, respond to and recover from a wide range of risks"
2. Governance that involves "a more integrated and mutually reinforcing planning and implementation approach among socio-economic development actors"
4. Urban planning that "keeps pace with increasing urban development needs (and) the increasing exposure to vulnerabilities"
Taking a tangential departure on the topic of building resilience within society, my wife shared a timely article in Psychology Today that discusses the physical changes that occur within the brain following a psychological trauma. While this blog focuses primarily on engineering, plans and policies that enhance resilience and protect the lives of victims of disasters, this article discusses new findings about ways mental health professionals may be able to help communities prepare for, and intercede following, a natural disaster. The goal, of course, is to enhance the ability of the individual (and, thereby, society) to deal with short-term stress and avoid long-term complications that could remain if left untreated. "This research is noteworthy for a few reasons. First of all, a picture of [the post-traumatic stress disorder] PTSD brain changes over time starts to come into focus.... pointing to an avenue for further research to understand how chronic mental illness unfolds over time. For example, while NAA level alone may not be a specific way to diagnose PTSD because it is common in other conditions, NAA level over time may be a way to gauge progress of care, as could measuring changes in brain volume for conditions where treatment returns the brain to a more normal state. "The other markers are important because they may end up being helpful stepping-stones along the path to figuring out what short- and long-term trauma and stress do to the brain.... Being able to analyze metabolic activity and understand what it means is a key part of the puzzle, along with looking at changes in brain volume and activity based on blood flow. "All of these approaches can help inform our understanding of altered brain networks, a crucial conceptual tool for seeing the brain as a dynamic, measurable system; as a framework for molding brain activity back to a non-PTSD state (e.g. using targeted neuromodulation like transcranial magnetic stimulation TMS, and other therapeutics); and to help understand how to support and establish resilience."